A donation to the Guild in your will is a perfect way of ensuring that our work can continue in the years to come. For further information, please contact the Guild Treasurer. Sponsored activities, Quiz Nights, Fun Runs … there are so many original and enjoyable ways to raise money. Why not share your good fortune with others, and have fun doing it at the same time! If you are planning any fundraising activities, contact us beforehand for information and support material. Every donation, large or small, is equally appreciated. The form is on page 21 of the annual review. Should you wish to make a regular donation, a BANKERS ORDER is a simple and reliable method. The form is on page 21 of the annual review. 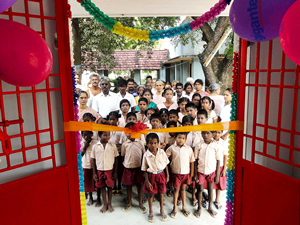 These children from Fathimanagar, India are waiting for the ribbon to be cut at the new shoe making workshop, financed by the Guild. As long a you are a taxpayer, your gift will be worth an extra 25% to the Guild if you Gift Aid it - whichever form of donation you choose. If you are working, the Payroll Giving scheme is a simple and tax-effective way of supporting our work. Most Government departments and large companies operate the scheme, whereby donations are deducted from pay automatically before income tax is calculated under PAYE. Small numbers of shares can be uneconomic to sell and more trouble than they are worth to keep track of. If you decide to give shares, however few in number, to the Guild, you will not only be helping the victims of leprosy but also earning income tax relief and exemption from capital gains tax.